The eighth post of the series is up! For this article, we asked the the talented landscape painters Peter Brown and JOPP 2018 Commended Entry Emily Powell what advice they would give to emerging artists. Peter Brown, otherwise known as ‘Pete the Street’, has become known for his street paintings of Manchester, London, Oxford, Cambridge, Cardiff, Chichester, Bath and Henley-on-Thames. He rarely paints in the studio, preferring to work directly from the subject on site in sometimes the foulest of weathers. He works in charcoal, oil and pastel for which he has received numerous awards at various national exhibitions; he has also been featured by BBC Radio Bristol and BBC1. View more of Pete’s work on his website, Facebook, Twitter and Instagram. 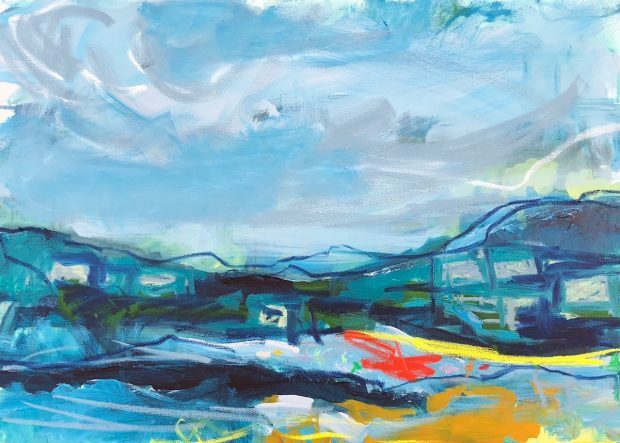 Powell’s practice explores an extensive range of mediums and substrates to produce what have been critically acclaimed as vibrant, energetic, expressive and gestural paintings, both plein air and in her Devon studio. She explores capturing the intensity of her sensory and ephemeral experience through colour, tactile use of materials and expressive mark making. She was also awarded a Commended Entry during Jackson’s Open Painting Prize 2018 for her stunning painting, ‘Exe Estuary’. View more of Emily’s work on her website.